Update, April 5: Hearthstone’s spooky new Witchwood expansion is set to launch on April 12. Beware the darkened forests of The Witchwood next week, for Blizzard have confirmed the release date for Hearthstone’s ghastly expansion. April 12 will see the launch of expansion with 135 new cards, accompanying new mechanics, and a new single-player mode to kick off the Year of the Raven in style. Here’s the full Witchwood card list so far. You can still pre-order for a big chunk of bonus cards, with 70 packs in total. Either way, you’ll be able to log in after The Witchwood’s launch for three bonus card packs and a random Class legendary card all from the new set. If you’ve missed out on the new mechanics, check out what you can do with odd and even mana decks or the Echo ability. Ben Brode and Sean “Day” Plott will take to Twitch on April 9 to finish up the season of card reveals, so stay tuned for details on the remaining Witchwood cards. Original story, March 12:Blizzard have confirmed the first expansion for Hearthstone’s Year of the Raven. 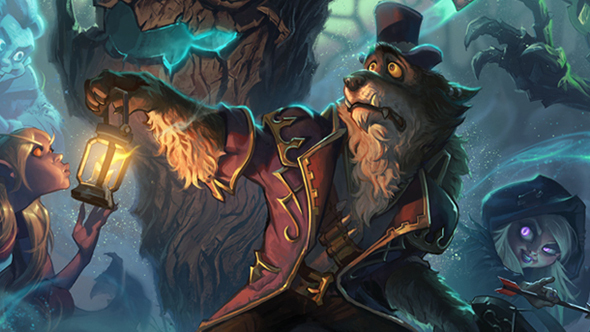 Titled the Witchwood, we’ve got a look at the first few cards for the spooky-themed add-on, and some details about what to expect from the new single-player mode. We’ve gotten a look at six cards so far, and they introduce three new abilities. Start of the Game gives you special powers if your deck meets certain conditions when the round begins. Echo lets you play a card multiple times in a turn by putting a temporary copy of itself in your hand when the card enters play. Rush, much like Charge, lets a minion attack immediately, but only against other minions. Ben Brode and company provide more details on the gameplay implications of the new cards in the Blair Witch-style video above, adding to a delightful collection of very strange Hearthstone trailers. The new single-player mode is Monster Hunt. As one of four new heroes you’ve got to make it through eight increasingly challenging battles that culminate in a boss fight. The heroes all have a unique hero power and their own cards to help build new strategies, and each encounter you clear nets you loot in the form of cards to improve your deck for the remainder of the hunt. The Witchwood adds 135 new cards, and the pre-purchase offer includes 20 bonus packs, for a total of 70 card packs when buying in, in addition to a new card back. The expansion is set to release sometime before the end of April.